Our Silver Pillar Skeleton Clock features piano finished top & base, with silver pillars, clock works & engraving plate for personalization. 5556RC = 7 3/8" x 2 3/8" x 9 1/8"
Do you have a pillar of strength in your organization? Most institutions have a few people that consistently provide support as does a pillar. These are the people who achieve great things in your school district, your church, or your business, and you trust and depend on them. How do you show your appreciation to these pillars of the community? 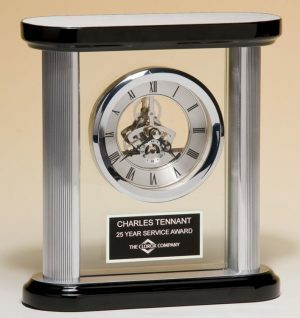 We suggest you thank them with our Silver Pillar Skeleton Clock. This extraordinary timepiece rests on its rosewood colored base. 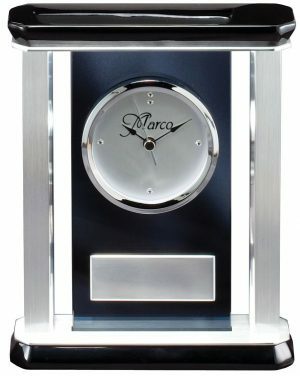 Two silver pillars support a matching wood top piece, and they surround a transparent slab which suspends the clock. The clock has a silver face and Roman numerals to mark each hour. The inner workings of the timepiece are exposed for all to see while two delicate black hands sweep across the open face. We have included a matching silver engraving plate below the clock, and our design team will engrave up to three lines of type for free. Give us the name of the pillar of strength you know, a date, a company logo, or a reason for the award, and we do the rest. Show your gratitude to the pillar in your community service group, your corporation, or school district. Buy that person our Silver Pillar Skeleton Clock.